Rising productivity, profitability and stock prices have long been heralded as signs of economic recovery from the Great Recession. Many segments of the population, however, have yet to experience any relief. Initially concentrated among the upper classes, gains in employment, income and wealth have gradually spread to middle America, but many groups, including race/ethnic minorities and young people have been left behind. With an unemployment rate roughly double that of their white counterparts, young African American college graduates have even greater difficulty securing employment. 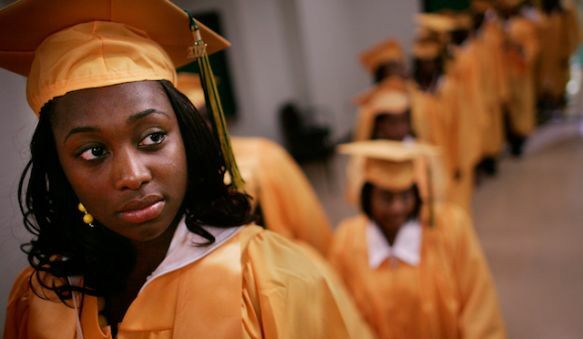 The Center for Economic and Policy Research reports that in 2013, 12.4 percent of African American college graduates age 22-27 were unemployed, compared to 5.6 of all college graduates in this age group, and more than half of those who had jobs were underemployed. Those with degrees in the highly sought-after STEM fields (science, technology, engineering and mathematics) fared little better, with unemployment and underemployment rates of 10 percent and 32 percent respectively. Sociologists have provided compelling evidence that discrimination accounts for at least some of these disparities. Audit studies – wherein researchers create a fictitious pool of job applicants and compare results for individuals matched on factors apart from race – have been enormously helpful in identifying race-based discrimination at the point of hire. Devah Pager, for example, observed that African American applicants responding to help wanted advertisements in one U.S. city were less than half as likely to receive callbacks compared to similar white applicants. African Americans with no criminal record, moreover, received fewer callbacks than whites with felony convictions. Studies conducted by economists have yielded similar results. Sociological research on managerial gatekeepers has been instrumental in revealing factors underlying such discrimination. In Stories Employers Tell, Philip Moss and Chris Tilly explain how racial stereotypes influence managerial perceptions of African Americans’ “soft skills” (e.g., communication, “friendliness” and “approachability”), and describe how concerns about “fit” with customers and staff shape managers’ view of prospective employees. As the share of jobs requiring face-to-face interaction grows, they argue, race becomes an increasingly salient influence on employment prospects of job seekers. Although a college degree should signal to employers that an applicant possesses both job and social skills necessary to function productively in a professional work environment, Adia Harvey Wingfield’s No More Invisible Man, explains how stereotypes of African Americans can generate increased scrutiny and harsher judgments in professional settings. A separate study likewise documented that lawyers who believed a writing sample had been prepared by an African American man scrutinized it more closely and applied harsher judgments than did lawyers who were told the identical sample had been prepared by a white man. Job leads and recommendations via informal social networks are key factors in converting skills and educational achievements into employment in one’s field of study. Sociologists have shown how these processes also hamper the prospects of African American job seekers, whose social networks are less likely to produce beneficial information. Deirdre Royster’s Race and the Invisible Hand, for example, documented how differential access to informal social networks generated markedly different outcomes for African American and white graduates of a trade school in Baltimore, Maryland. White teachers informally shared information connecting white students to available jobs, while African American students, who received no such assistance, were forced to rely on the school’s formal job search office and their own social networks – neither of which offered fruitful connections to the kinds of jobs for which they had trained. As a result, despite taking courses with the same teachers and receiving the same certification, African American graduates were far less likely than their white counterparts to maintain stable occupational trajectories in their fields of study. As Royster’s work highlights, contact alone is insufficient to secure the benefits of network inclusion. Converting institutional connections to friendship ties and making the choice to help are instrumental in transforming network connections into network advantages. Furthermore, whites, especially males, are often the recipients of such generosity – a point that is underscored by a recent study showing that professors, especially those in private institutions and higher-paying disciplines, more often agreed to meet and discuss research opportunities with white male students than with white women and members of race/ethnic minorities making the same request. While these examples suggest discriminatory treatment of race/ethnic minorities, Nancy DiTomaso’s The American Non-dilemma: Racial Inequality without Racism alerts us to how, even in the absence of racism, social networks that connect white people to one another and provide unearned labor market advantages reproduce and maintain racial inequality. In the post-Civil Rights era, DiTomaso explains, favoritism benefitting similar others, rather than distaste for (or mistreatment of) dissimilar others, is responsible for much of African Americans’ labor market disadvantage. Gaining access to the advantages of racial privilege without racism or intentional sabotage is the “ultimate white privilege,” according to DiTomaso – helping whites to secure their economic and occupational futures while absolving them of guilt in the maintenance of racial inequality (p. 337). Some even view themselves as victims of so-called “reverse discrimination.” Linkages to disadvantages faced by others are hidden in plain sight, as white individuals recounting myriad unearned advantages that helped them ascend the socioeconomic ladder nevertheless characterize their successes as individual achievements rooted in their own talent, effort and perseverance. That processes so central to mainstream sociology’s understanding of labor market inequalities are largely missing from media coverage of unemployment obscures a core fact: that unearned advantages gained through network membership are intimately connected to the plights of people who have played by the rules but will never get to compete on a level playing field. Greater media attention to these issues could help to generate a sense of ownership of these processes and responsibility for what they have wrought. Realization of their own culpability in disadvantageous outcomes for African Americans may give pause to white Americans – some of whom may begin to think more critically about their own actions, reach out to (or support increased assistance to) African American job seekers, or at minimum, see more clearly how they have benefitted (or not) from network memberships, discarding notions of “talent,” “effort” and “perseverance” as sole determinants of labor market success.